Zemaye’s Take: For those of you who told me that salicylic acid doesn’t do anything for your breakouts, here are two new things to try: sulphur and charcoal. Charcoal absorbs excess oil. Masks and scrubs that contain charcoal are good for oily skin that easily gets pimples. If you can’t find a mask or scrub with charcoal, then make one. Please where are all those people who studied biochemistry and chemistry and nutrition in university? Why are they not making things? Charcoal is easy to get. Charcoal works as a skin treatment. They should make products with charcoal abeg. Also buy sulphur ointment from the pharmacy. Wash your face gently. Don’t over-wash or over-do anything because you will just annoy your skin and make it produce more pimples. Use charcoal mask. Wash off after thirty minutes. Rub a bit of sulphur ointment on the pimple. Be patient. 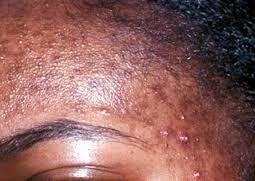 A pimple treatment needs at least two days to work.